Our stories should inspire people to positive action to improve our communities. We will not just share the news and the events happening in our community, we will empower people to make good decisions about community betterment and improvement. When we discuss the improvement of our community, we will hold people (and ourselves) to the highest standard of excellence possible. This is our community, too, and we seek excellence in all that is done. When discussing sensitive issues, we will engage all relevant sides of the story to make sure that we are getting a complete picture. We will not pick fights. While we appreciate dissent in discourse, there is a way to do so that elevates the conversation and builds consensus rather than devolve into a skirmish. When sharing news, we will strive not to be first for the sake of being first; instead, we will strive to present the most accurate and complete story first. In reporting stories, we will not use anonymous sources unless there is a definite need to do so. While our program will have sponsorship, our sponsors will not interfere in the editorial content of this program. Our story is downtown’s story. 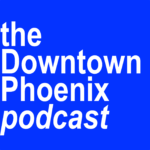 We will define “downtown Phoenix” as areas in Phoenix where urban living is the way of life or is becoming the way of life. We do not see downtown as a limited geographic area; instead, we look at it as a philosophy. When we discuss sensitive issues about our community, we will discuss and engage those issues with the utmost care and depth, as we would like if that story were about us. We will also assume that our listeners are knowledgeable about urban issues. We recognize that our program will present diverse opinions. We will present opinions as opinions and facts as facts and make sure to separate them.